Located near Goliad, Texas, Mission Espiritu Santo, was Spain's attempt to colonize this region in the North American frontier. It was only after decades of unsuccessful treasure hunting expeditions let by Coronado and others, that Spain began establishing colonies in what is now Texas. They saw the Native Americans as cheap slave labor and their Catholic priests as instruments of control over them. The mission was established in 1722. After two failed locations due to lack of a food supply and failure to convert the locals, the Mission moved to a location near the Spanish fort of La Bahia. The Comanche raids continued to shape the Spanish decisions about Texas missions. The mission became a ranching operation and grew to the largest in Texas with an estimated 40,000 head. The mission armed the local native people to combat the raids by the Comanche, however, the Comanche would influence the location and progress of Texas settlements for another hundred years. I tried to find something about the painting but struck out. The name Espiritu Santo means "Holy Spirit." 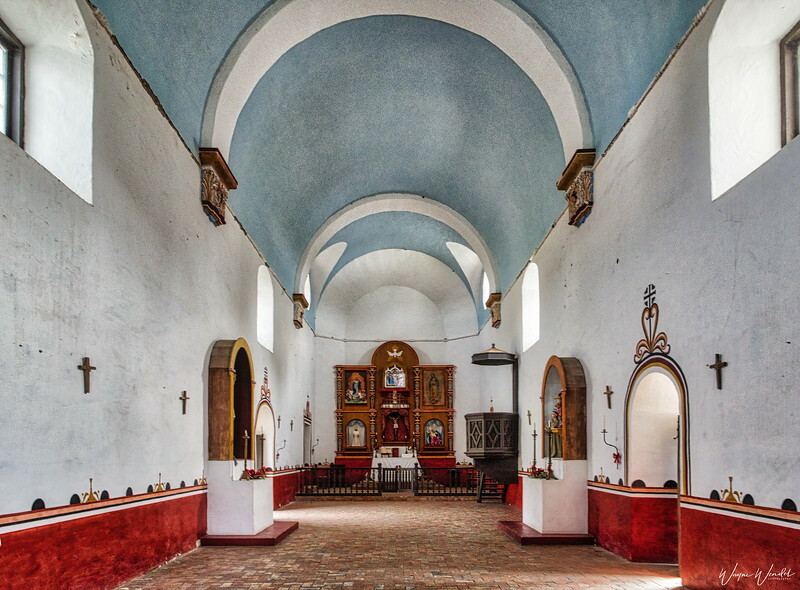 The original photo I had uploaded was taken in the Presidio La Bahia chapel. This is the Espiritu Santo chapel. Stunning POV, Wayne. Let me know next time you visit Goliad and I will meet you there. BTW...my photos appear to be HDR, but it is really Tonal Contrast in NIK's Color Efex Pro 4. Beautiful mural and shot! Happy Thanksgiving! Wow, this is wonderful. I must put this place on my list to visit. Beautifully captured. Happy Thanksgiving Wayne! Beautifully captured painting of Espiritu Santo!